were too pretty (& yummy) not to share! If you know me and my husband really well, then you know that between the two of us, he's the cook. That's not to say that I can't cook (at least I think I can) or that I don't enjoy it when I do, but cooking is my husband's hobby. He absolutely loves to cook. He loves cooking and trying out different recipes, and more often than not, he comes up with his own recipes based on what we have in the fridge/pantry. I know, I know. I totally lucked out in marrying this guy, huh? But ever since Pinterest showed up, I have found so many images of recipes that have motivated me to get in the kitchen and take over the cooking reigns a bit. And I've found that I too, enjoy cooking. 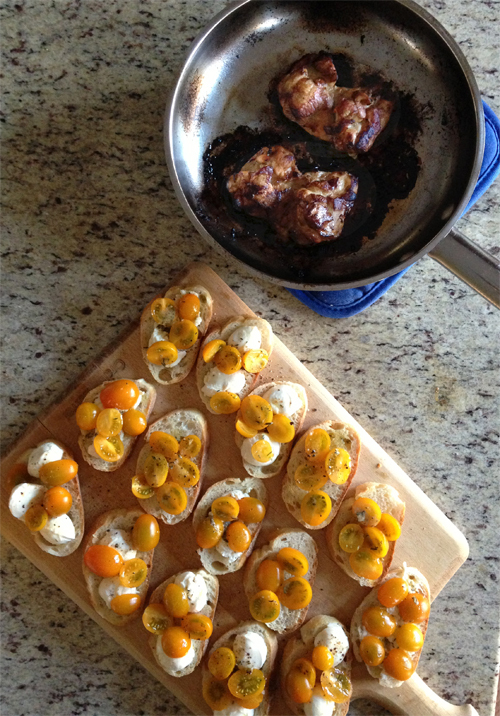 Just recently, I came across this yummy peach tomato crostini recipe and took inspiration from that for last night's meal. We both wanted something that would be summery and easy to whip up since during the week, we're both tired by the end of the day. 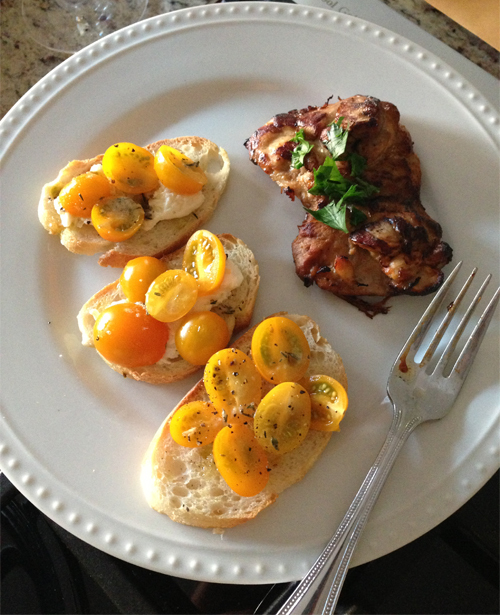 And what's simpler than a crostini to go with some already marinated chicken from the grocery store? Not much, people. Instead of ricotta in the recipe, I used bocconcini (small mozzarella bites) and used Zima tomatoes (the most delicious tomatoes you will ever have). Steve, who is a master at creating vinaigrettes, made a red wine vinegar and olive oil one to drizzle on top. He doesn't follow a recipe when he makes his vinaigrettes, but if you want to try something like his, definitely use Ina Garten's recipe. And we totally had peaches but I completely forgot to add them in! Doh. I blame hunger. 1. Slice the baguette to the thickness you want. Pop the slices in the toaster to get a little golden on top. 2. Once they've toasted, rub the clove of garlic on one side of the bread. 3. 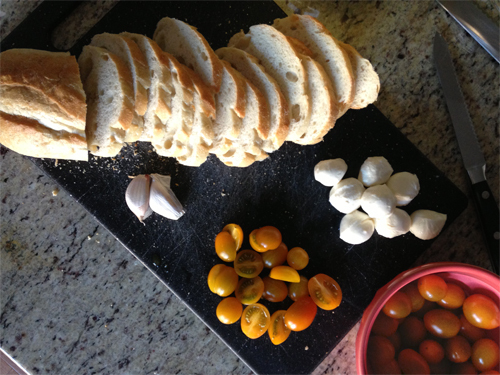 Place the bocconcini and tomatoes on top of the bread. 4. Then drizzle the vinaigrette (directions below) over the bocconcini and tomatoes. 1. In a small bowl, add a pinch of Thyme, a few cracks of Pepper, a pinch of Salt, some Garlic Salt, and Dijon mustard. 2. Whisk in the Red Wine Vinegar. 3. Slowly incorporate the Olive Oil. And voilà! The Fresh Market (a grocery store ridiculously close to our house) offers semi-prepared meats (same prices as the non-prepared meats), so all we needed to do was cook the chicken. Easy to do, right? The one I picked up was balsamic marinated chicken. So yummy! These look delicious! You are a domestic goddess :) Great photographs, too. 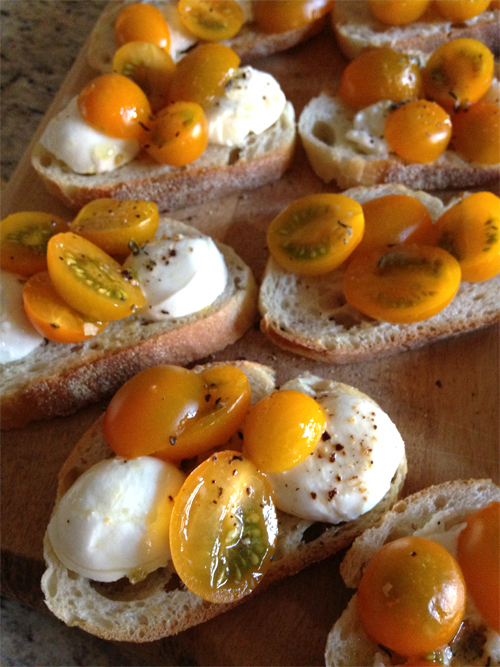 I love anything on a crostini ... especially pretty little yellow tomatoes! Peaches would be amazing! But these look almost too pretty to eat. I bet they were delish!